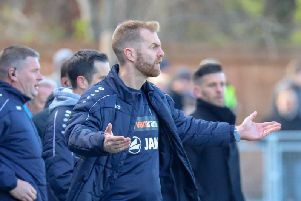 Harrogate Town were the architects of their own downfall as they bowed out of the FA Trophy at home to Stockport County. Here's an assessment of how Harrogate Town's players performed during Saturday's 4-2 defeat. James Belshaw 6. Left badly exposed on far too many occasions. Managed to pull off a good save to deny Scott Duxbury at 3-1. Ryan Fallowfield 7. Did his best to provide width down the right. Contributed a good assist for Town's second of the afternoon, but his slip let Duxbury in on goal. Callum Howe 7. Didn't do too much wrong on a day when he was part of a back-four that shipped four. A couple of crunching tackles. Liam Kitching 6. It was his error that saw Stockport take the lead and this won't be a match that the young defender will look back on fondly. Booked. Warren Burrell 5. A poor display by his usual high standards. Got away with giving the ball away a few times in the first half, but not in the second where his under-hit back-pass led to County's third goal and killed the game. Lloyd Kerry 6. Busy as ever in midfield without quite managing to shine like he has done in recent weeks. Josh Falkingham 8. ADVERTISER MAN OF THE MATCH. The one real bright point for Town. Passed the ball nicely, particularly in the second period where he threaded a number of intricate passes. Jack Emmett 6. Began well and his excellent work led to the hosts breaking the deadlock, though he faded after losing the ball as Stockport drew level. George Thomson 6. A mixed bag. Failed to take Town's two best chances, gave up possession for County's fourth, but got into dangerous positions and did manage a goal late on. Mark Beck 6. A couple of good moments and some nice flick-ons, however he could not hit the levels he found against Hartlepool last time out. Jack Muldoon 6. Always works hard for the cause. Wasn't able to really influence matters in the final third on this occasion. Substitutes: Joe Leesley 6. (On for Emmett, 63). Aaron Williams N/A. (On for Muldoon, 73). Jack Senior N/A. (On for Howe, 84).